When you can’t meet in person, telepresence technologies like Zoom’s ZoomPresence try to create the next-best thing: remote environments where the look and positioning of conferencing equipment make it feel like everyone is in the same room. If it sounds complicated and expensive, you’re mostly right. Enterprises pay tons of money for high-end telepresence setups. ZoomPresence claims to be simpler and less expensive, but when we tried it, it didn't quite meet its promises. In the corporate world, telepresence is best experienced in the conference room. Large-screen monitors, an HD camera, and high-end microphones let you turn the wall into a window that looks upon a similarly-equipped room at your remote office or a client’s. Other users can dial in from desktops or mobile devices, letting everyone share in an immersive illusion that they're in the same room together. It’s the typically fixed nature of these conference room setups that elevates a telepresence solution over what you typically get with, say, a Skype chat or a Google Hangout. ZoomPresence: low-cost telepresence you set up yourself. For ZoomPresence, which works in conjunction with Zoom's video conferencing platform, you set up the system yourself on your own hardware, thereby keeping costs down. It starts with a piece of MacOS software you install on a dedicated device—typically a Mac Mini—which lives in your conference room. Once installed, you attach a quality webcam and a USB speakerphone, then hook up the Mac to a monitor or television and connect it to ethernet or your Wi-Fi network. Once you log in through the ZoomPresence app (which automatically loads when the Mac is turned on), you’re pretty much ready to go. The next component of the system runs on your iPad. With the ZoomPresence app, you can use your tablet to control the teleconference, changing the display between single-camera and multiple-camera views, muting audio, and so on. 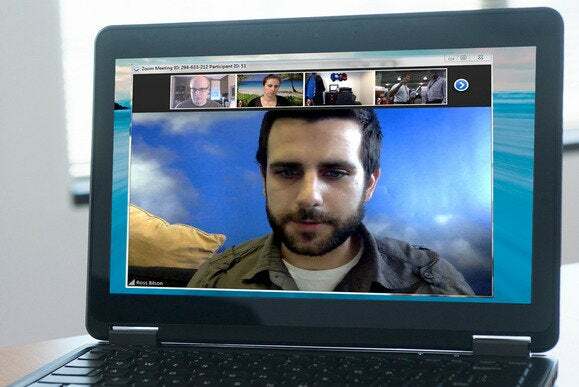 The interface is simple, and the system supports 100 interactive video chatters or up to 1,000 one-way viewers of a webinar (depending on your subscription). ZoomPresence allows you to control the teleconference from your iPad. The telepresence system is nice, but you can actually do considerably more with the Zoom software if you’re connected through a PC client. (This client app is unrelated to the ZoomPresence software.) Screen sharing, complete with annotations, is the big draw here. With the latest version of the Zoom client (which I tested in beta), however, you can even publicly share the screen of your iPad as well as your PC—an uncommon feature among videoconferencing services. Note that you can’t do this through the ZoomPresence system or the iPad control client, only through the Zoom PC client. While the Zoom ecosystem is stuffed with features, the company hasn’t been so successful at making all of this easy to use. Setting up ZoomPresence in my home office involved an almost comical, multi-day troubleshooting session, driven in part by the fact that there’s an incredible lack of documentation to date, making self-service difficult. Error messages are cryptic and rarely point you toward what’s actually wrong. Zoom's PC client—but not ZoomPresence—allows you to share your iPad screen. On the whole, however, if you have even passing familiarity with videoconferencing mainstays like GoToMeeting or WebEx Meetings, you’ll probably have little trouble mastering Zoom once you’re up and running. Some features, like sharing an iPad screen, require some extra steps and lots of high-tech know-how. Note that Zoom does not sell the hardware to make ZoomPresence work. The company says it is updating its marketing materials to clarify this. (At press time the company’s website implies the system costs $999 plus subscription fees, which is in error.) In other words, you’ll need to bring your own hardware to the party. By my calculations, you can obtain a Mac Mini, speakerphone, and high-end webcam for about $730, which prices ZoomPresence attractively compared to other SMB solutions like Google’s Chromebox for Meetings. And if you happen to have any of this equipment on hand already, well, all the better. This DIY solution provides telepresence at a fraction of the cost of major competitors, but still has some usability issues that need working out.